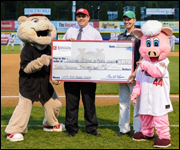 The Tri-City ValleyCats were honored by the Rensselaer County Regional Chamber of Commerce with the Van Rensselaer Small Business Award, in recognition of their outstanding contributions to area communities. The 'Cats donate to hundreds of charitable organizations each season, including the American Cancer Society, American Heart Association, American Red Cross, Arthritis Foundation, Boys & Girls Club, Capital District YMCA, Community Hospice, Drug and Alcohol Prevention Coalition, Leukemia & Lymphoma Society, Make-A-Wish Foundation of Northeastern New York, Muscular Dystrophy Association, National Kidney Foundation, Ronald McDonald House, Special Olympics and many more. SouthPaw and friends entertain fans all summer long at "The Joe," but they also love to hit the road and visit different events throughout the community! 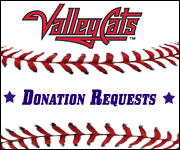 Find out how the ValleyCats can help with your fundraising event through a wide variety of in-kind donations. The ValleyCats and Blue Shield of Northeastern New York have teamed up to create this field renovation program that assists with renovating youth ball fields throughout the Capital Region. 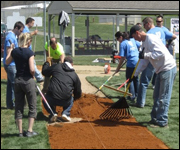 It kicks off each April with the '4 in 24' project, where fourth youth ball fields are renovated in under 24 hours. 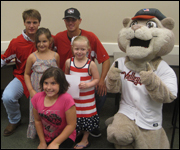 ValleyCats players and staff donate their time each summer to participate in numerous baseball clinics around the area. The 'Cats host two in-depth academy camps at "The Joe" for children ages 6-12. 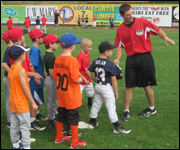 These camps are filled with professional baseball instruction, exciting games, drills, and more. Each season the 'Cats host special theme nights at "The Joe" to raise awareness for certain causes. They also partner with local businesses to provide donations to many non-profit organizations, schools, libraries and more. 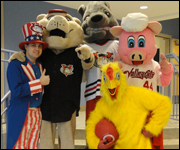 The Tri-City ValleyCats are proud to have created an anti-bullying campaign in collaboration with BlueShield of Northeastern New York, that features a children's workbook, mascot skit and peace pledge designed to help children understand what bullying is and how to properly treat others. 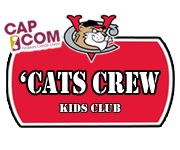 The ValleyCats mission is to "Create Fans for Life," and the CAP COM 'Cats Crew Kids Club is where it all starts! A 'Cats Crew membership is for all children up to age 12, and features many exclusive benefits! 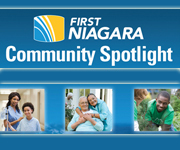 The Tri-City ValleyCats have partnered with First Niagara on a season-long community initiative known as the "Community Spotlight." During each of the ValleyCats 38 home games, a different nonprofit organization will be highlighted with in-stadium exposure throughout the night.